The short story “Trucks” first appeared in Cavalier, a men’s magazine, in June of 1973, which probably means that no one actually read it, or very few people did anyway. It was later published in Night Shift, King’s first collection of short stories, in 1979. This was King’s first venture into automotive horror. It’s not a sub-genre many of us ever consider but as King demonstrates in Danse Macabre it certainly exists. “Even such a much-loved American institution as the motor vehicle has not escaped the troubled dreams of Hollywood…” (Danse, 163-4) From this tone we can see we’re usually not going to be dealing with masterpieces even within the genre. He then goes on to discuss a movie starring James Brolin called The Car. “The movie degenerates into a ho-hum piece of hackwork before the end of the second reel (the sort of movie where you can safely go out for popcorn refills at certain interval because you know the car isn’t going to strike for another ten minutes or so).” (Danse, 164). 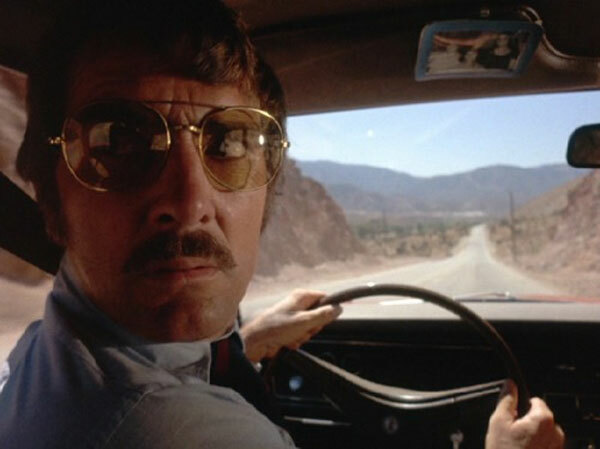 We later are given a sense of what would be a better tale and King makes reference to Spielberg’s Duel (164) but ultimately concludes that to find other interesting car stories one should look towards stories and novels (164). So, if King was not actually told to do this story because it was the one that De Laurentiis was willing to buy from him, perhaps he thought he was better off going into territory that hadn’t been handled all that successfully in the cinema. King’s tale is very short and obviously needed to be expanded upon in order to make it into a motion picture. While the short story isn’t perfect, there are areas in which it is much more successful than the film. First off, we get no moments of comedy in the tale, unless we’ve seen the film, and I like the way the characters interacted in prose better. In the short story there was more of an emphasis on waiting it out and also on speculation of impact. The characters discuss how much food they have stored and start to fill jugs with water; these issues are not addressed in the film, it’s as if everyone knows they’ll only be trapped for two days at most. The impact of these trucks taking over may have plays itself in the mind of the narrator and occasionally through dialogue. When there is a debate over pumping gas; the issue of being slaves to the machines comes up. Billy imagines people all over the country pumping gas into driverless trucks. He imagines an escape to a cave a digression to near pre-historic times. The inability for the trucks to reproduce and the contrast of whether or not they were currently being assembled at that moment was also postulated. Where the story is similar in some places is meaningless because of the way King approached the short story. He starts with the people already stuck in the truck stop. Even if the studio would require the cockamamie comet excuse later on, fine but it is much more frightening without such an outlandish set up; a set up might I add that doesn’t logically lead to machinery working and thinking on its own. Another way in which the short story is superior is in the ending. Here’s the way it ends: “Two planes leave silver contrails etched across the darkening eastern horizon. I wish I could believe there are people in them.” (Shift, 142). And it’s over. They’re stuck and it doesn’t look like they’re going anywhere. It’s a great ending, but obviously not one many film production companies will want to have, so King had to change. Stephen King has always been a fan of the unknown and while he knows it’s difficult he occasionally likes to leave things opaque like in Dreamcatcher. It may have been better if he had been allowed to do that with this film. In fairness to the film, the characters were more drawn out than they were in the short story. It was just a case of having too many and not having enough time to deal with them all.